Locally made with bold, playful, contemporary design. Lightweight, moisure-wicking, and quick-drying. All the skiers in the family just love them! I have many hats and neck gators from Skida! Love the products and many patterns! I love my new Skida Alpine Hat. It is so warm and the pattern (Little Grace) is a breath of springtime! Been wearing this in the chilly coast! Love it! I like the thickness, since I'm bald. Skida was founded in 2008, when young Vermont skier Corinne Prevot was looking for a hat that was both warm and colorful. With limited options for cross-country skiers, she started designing and making her own hats—first for herself, then for friends, family, and fellow skiers. Soon the demand for the vibrant hats grew, and today Skida creates a range of hats, headbands, and neckwarmers in distinctive, limited edition, and energetic patterns. For insulated protection from the harshest elements, Skida’s Alpine Hat is lined with a layer of soft fleece. The Alpine Headband and Neckwarmer are lined with lightweight Polartec micro-fleece. 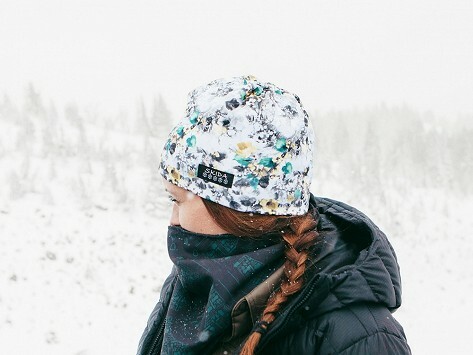 Skida works with a network of seamstresses in Vermont’s Northeast Kingdom to keep up with the high demand for colorful hats and cold weather accessories. Keeping the sewing local is a priority for Corinne and the Burlington-based team of outdoor enthusiasts. Skida continues to share the love by supporting local athletes, non-profit organizations, and charitable events.